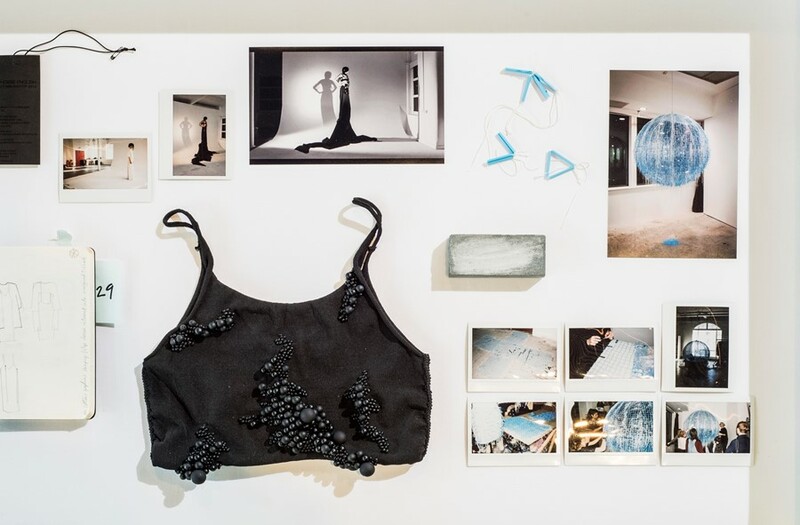 Featuring a magnificent glass bead sculpture suspended from the ceiling along with unseen polaroids, notebooks and sketches, designer Phoebe English’s Floating, Falling, Drowning, Flying exhibition at London’s NOW Gallery explores the work that goes into fashion behind the scenes. “It’s about making something that’s accessible to the general public, not just on an art or fashion basis – everyone can relate to it,” she explained at the show’s opening last night. “We’ve tried to make it people friendly!” With cases which display delicate netted and velvet pieces from her AW15 collection alongside images that detail the references behind and making of a collection, the show not only provides insight into the processes of fashion design, but breaks down a wall to let the general public in on the secrets too. 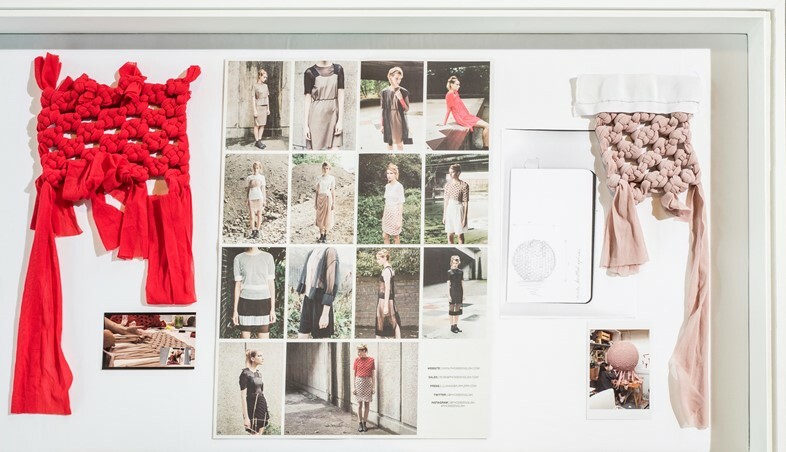 Read on to hear what the designer had to say in her own words. Where does the name Floating, Falling, Drowning, Flying come from? Phoebe English: It’s something that I wrote which is a metaphor for the different processes, the feelings that are equated with having an idea and then getting to the final thing. The floating is the purity of the idea and being really excited about this amazing thing you thought of, the falling is the struggle to get it realised, the drowning is the exasperation of not being able to do it, and then the flying is being able to do it. It was something I wrote years and years ago – when we were doing an exhibition about process it kind of fitted nicely as a title that kind of encompassed all of the different processes of making a collection. How does this compare to previous projects? Phoebe English: Well it’s the first time I’ve done anything for a gallery space, so it’s the first time I’ve ever been to my own show – that’s quite a funny experience. It’s very weird to not be backstage in a dressing room... it’s been very different from doing a fashion show. There are fewer people to deal with, no models to locate before a show! Where there any sleepless nights? Phoebe English: Yeah, lots of late nights – we’ve been working on it for 12 months so it’s been going on for quite a long time. Phoebe English: I suppose a greater insight into how we work as a label – our working practises. And maybe more of a greater understanding of the background work that goes into a collection rather than just the glossy image at the end.